Would they make colleges safer? Mass shootings at colleges and universities are spurring lawmakers in a growing number of states to consider allowing students, faculty and others to carry concealed firearms on campus. The American public is evenly split on the issue. 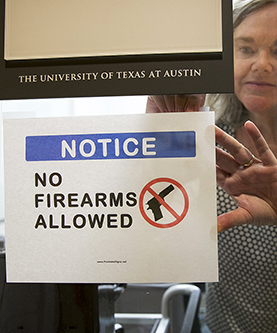 Gun-rights supporters say shooters specifically target gun-free spaces such as college campuses. And many students say their constitutional right to bear arms shouldn't end when they walk on campus. But those opposing guns on campus say students with gun permits are not necessarily trained to stop violent crimes. They also note the unique nature of students on college campuses: Young adults' self-control brain functions are not yet fully developed, students often engage in heavy drinking and an increasing number of students are reporting anxiety and other mental health problems. All of this, say foes of guns on campuses, means firearms will make campuses less safe. Debate is also fierce over whether campus security forces should be armed and how colleges and universities can improve counseling services to identify potentially violent students.